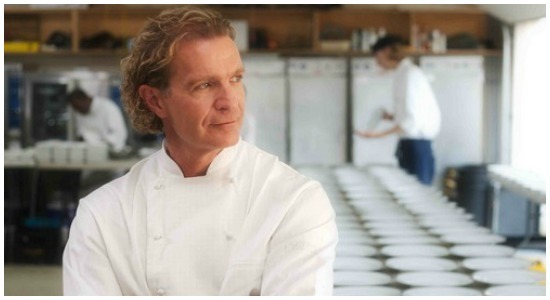 Chef Mark McEwan curates the November edition of the Chef's Box -- a monthly artisan food subscription from FoodiePages.ca. Below he shares his latest travels, top five recent meals and favourite local eats in Toronto! Day job: Managing, planning, organizing and menu construction. Daily uniform: Jeans and a snappy sport coat haha. I have a few: Bottles of wine...between the restaurants and home...just a "few." In the kitchen, I swear by: Being organized, the perfect mise en place is crucial. The taste I couldn't live without: A good white Burgundy. Hidden talents: I am an endurance style stand up paddle boarder, sometimes I am out there for hours. If my kitchen could talk, it would say: Eat at home once in a while and use me! Last place I traveled: Vancouver with a great group of chefs Anthony Walsh, Normand Laprise, Vikram Vij, David Hawksworth, Kristian Eligh and Scott Jaeger. Coolest street in Toronto: Yorkville -- during the summer you can spend a full day just walking up and down, grab a morning coffee at Zaza, shop, grab a good cigar, sushi at Asuka and all the great patios. People watching in that area is like a sport! Most romantic thing I've done for a girl: After sitting and thinking about it...apparently I'm not too good at romantic gestures...I will work on it. In life, what is most important to me is: Peace of mind. I get nervous when: I lose control of situations. My top five meals: Recently the top five would have to include Bottega, Keste Pizzeria, Per Se, the group dinner we put together for the Hawksworth Scholarship dinner and The French Laundry. The best farmers' market: It was the St. Jacob's Market -- a treasure, so many interesting items for sale. The best burger: I have a major weakness for anything from Burger's Priest. The best cheap eats: Grilled Chicken Souvlaki from The Burger Shack. My motto: Don't $%(* up, do it right the first time.